A delicious dessert that you can't do without once you've tasted it. 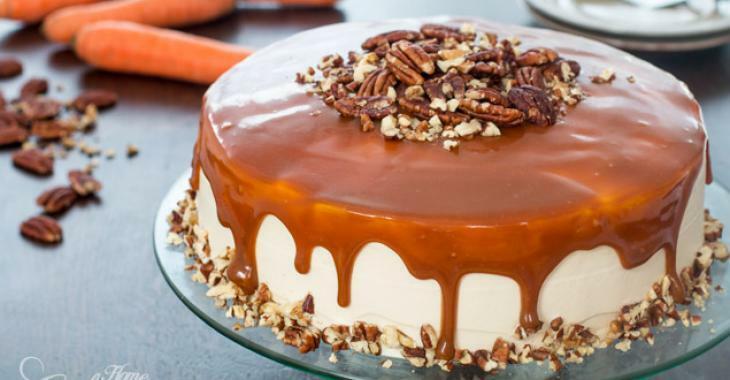 Do you like carrot cake and caramel ? Why not combine these two ingredients ! Warning: this recipe could make you totally addicted ! 1. Prepare the carrot cake layers. Preheat the oven to 350F (180C). Grease and line with parchment paper two round cake pans. 2. In a bowl, sift flour, baking powder, baking soda, salt, cinnamon and nutmeg. 3. In a large bowl, mix eggs and sugar. Add the oil and mix. Gradually add the flour mixture into the liquid mixture. Using a spatula, incorporate the grated carrots and pecans. 4. Pour the dough evenly into the molds. 5. Bake for about 30-35 minutes. 6. Allow the cakes to cool completely. 7. Prepare the caramel. Place the sugar and water in a saucepan over medium-high heat, and cook without stirring until the sugar dissolves and turns to a caramel color. 8. Remove the pan from the heat and add the cream. 9. Bake for about 1 minute, stirring constantly with a wooden spoon until smooth. 10. Remove from heat and add butter and salt. Stir until smooth. Pour into a small jar and let cool until the cake is ready. 11. Prepare the frosting. Beat the cream cheese. Add the caster sugar and 1/3 cup caramel. 12. In another bowl, whip cream until stiff peaks form. Gradually stir in the cream cheese mixture and mix well. 13. Assemble the cake. Place one cake layer on a serving plate. Spread evenly with a bit less than half of frosting. Add the second layer of cake. Gradually spread the remaining frosting on top and sides of the cake. Refrigerate for at least 2 hours. 14. Before serving top the cake with remaining caramel sauce letting some to drip down the sides. Decorate with pecans. The recipe makes about 12-16 servings (or less, for the greedy ones!) And you can refrigerate it for about 1 week. Watch the following video to discover each steps to create this delicious cake.